Oreo comes out with a new product every month or so now (or so it seems), so The A.V. Club offices are always teeming with birthday cake-frosting slathered sandwich cookies that we’re not all that excited about actually eating. That all changed when we heard about Reese’s Peanut Butter Cup Oreos, which blend the chocolate and peanut butter goodness of a beloved candy with the chocolate and cream goodness of a beloved cookie. We anticipated (be)loving them. Below you’ll find our precise reactions, but, in short, we pretty much did. 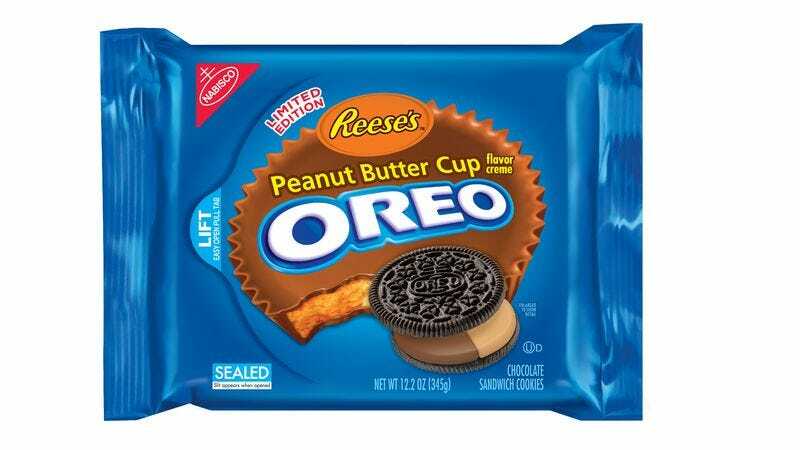 Those of us who liked them found them to be a perfect blend of Nutter Butter, Reese’s, and Oreo, and those who didn’t (cough Sonia Saraiya cough) thought the peanut butter cream tasted too artificial, as if an Oreo tastes like it’s from the earth. As visiting staffer Todd VanDerWerff noted, though, the cream does stick to the roof of your mouth just like actual peanut butter, so consume with caution.